All processes in Japanese Patent Office had been managed in writing before the computer was introduced. Japanese Patent Office started considering the installation of computers in about 1960, and the laboratory of mechanization was established in the General Affairs Department of Japanese Patent Office in 1961. In this laboratory, researches about the mechanization of the acceptance of patent application and mechanized search in the examination were started. The first computers were introduced into Japanese Patent Office in 1964, and it was determined to manage patent applications after January of 1965 by computer instead of the traditional original register on the patent application. Additionally, Chinese character processing by computer was begun in 1975.
International Cooperation Committee in Information Retrieval among Patent Offices adopting substantive examination principle (ICIREPAT) was established in 1961 because of the proposition of United States. 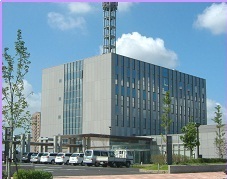 Japanese Patent Office participated in ICIREPAT and performed the search experiments from 1964 to 1975. This project can be said to be the predecessor of the present paperless project in Japan. Especially, F-term search system was made on basis of the experiences of this ICIREPAT system. This ICIREPAT project finally failed. One of the reasons seemed to be a low accessibility to documents at that time. The system at that time couldn’t display the search result on the monitor of the terminal, but output the document number of the found document by the line printer in the central computer room. Furthermore, it was very complicated to find and read the documents specified by the document number from the document files arranged in numerical order. For this reason, the system at that time had the bad reputation among Examiners, who were users. Examiners who had been responsible for the same technical area for a long time used to organize documents into files segmentalized according to technical areas to memorize the content of these files, thereby making examination efficient. On the other hand, when the automatic search was performed, the efficiency of examination was degraded because they couldn’t utilize their knowledge like this. Japanese Patent Office considered decreasing the number of the document found in the automatic search up to about two or three in order to compensate for the shortcomings that the accessibility to documents was low. However, it was technically difficult to achieve such the search. Total Patent System (TOPAS) project was proposed in the middle of 1970s. This project determined the causes of failure of ICIREPAT project and proposed the way to solve its problem. The points of this TOPAS project are showed in following a) to c). a) All documents which may be target of the search in Japanese Patent Office are included in the database. TOPAS is the project proposing to manage, as a database by computer, the content of a patent application, the content of procedure document, all official gazettes and documents necessary for the examination which was accumulated in Japanese Patent Office until then to make the contents of these gazettes and documents available for inspection through communication line in terminals of Japanese Patent Office. The content of official gazettes and documents are included in the database of and respectively attached with the international patent classifications again. Furthermore, in addition to the international patent classification, the facet classification for making technical search easy is also attached. The facet classification is consisted of the classifications on the basis of views such as purpose, material, technical effect and composition and is used to supplement the international patent classification. "Fig. 1 OUTLINE OF TOPAS SYSTEM"
b)The documents themselves found in the search can be read on the terminal. TOPAS was the system for making microfilms of each official gazette and each document, and for recording the microfilms by the industrial television to send the electrical signal to the terminal, or the high-resolution TV monitor. The reason to record the microfilms by industrial television and to send the TV signal was because only such method was possible at that time. c) The filing of electronic data together with the paper document at the time of filing patent application is requested to make the database of its content. The documents of patent applications were often prepared with the typewriter for Chinese characters. For this reason, Japanese Patent Office thought that it may be possible to prepare, by adding the auxiliary equipment to the typewriter for Chinese characters, the paper tape or the electromagnetic tape having the Japanese contents of documents in TOPAS project. In other words, Japanese patent office intended to have these paper tape or electromagnetic tape filed with written application documents at the time of filing patent applications. The contents of filed paper tape or electromagnetic tape are scanned and memorized by computer to be directly used for preparation of the official gazette and the database. The above TOPAS project wasn’t finally actualized. The biggest reason thereof was because there was no storage media to keep the large number of documents as the image data at that time. Additionally, the performance of the computer at that time wasn’t enough to actualize this project. The paperless project is the large system development project which has been started since 1984 to make the electronic database of all official gazettes and documents, thereby storing their contents into optical disks as the image data. One purpose was making the stored data available everywhere inside or outside Japanese patent office. Another purpose was to enable the automatic search of these official gazettes and documents on the basis of the technical contents. This is why the international patent classification was added to these official gazettes and documents. In addition to the international patent classification, the paperless project proposed to attach the facet classification called F-term with the official gazettes to find the specific document among the large number of the official gazettes and documents by the search key such as the international patent classification and F-term. As the 100 billion JPY to 150 billion JPY (400 million USD to 600 million USD at the exchange rate in 1982) was necessary to actualize the paperless project, Japanese Patent Office needed to raise the patent application fee and the patent annuity by 50% twice. Finally, Japanese Patent Office could get the agreements of relative parties by 1982 for the effort of Mr. Wakasugi, Director-General of Japanese Patent Office. As the development of the paperless system was large-scale and was going to took longer than 10 years and was going to have a large influence on the society, the development was advanced according to the following a) to c) basic policies. Before the start of the paperless project on July of 1984, the patent clerical total mechanization system task force was set up as the decision making body for actualizing concretely the paperless project in October of 1983. The patent clerical total mechanization system task force made the effort to fully perform above a) and b) principles and determined important matters in operational policies, schedules and developments. The meetings of the task force were held 62 times from October of 1983 to December of 2000. Japanese Patent Office started the development of the F-term search system in 1984 to actualize the automatic search by computer. Before the automatic search, Examiners prepared the classification called FI obtained by segmentalizing, as necessary, the international patent classification assigned to each of them, and they organized patent documents into bookbinders according to this FI (hereinafter called fascicle below). And, they searched by flicking through the fascicles. However, as the search refinement of documents based on FI had a limit, the group of documents narrowed by the automatic search should be smaller than FI. For this reason, the new facet classification called F-term was thought of. F-term was obtained by organizing, in the technical field assigned to an Examiner, each type of viewpoints unique to the technical area on the basis of his or her experiences to index the viewpoints. The group of documents meeting the requirements is narrowed by search formula which is varied by each viewpoint and is including ‘AND’, ‘OR’ and ‘NOT’. F-term was supposed to narrow into the adequate number (up to a few dozen) for screening. And then, F-term search system finally started to operate in 1985. And, ECLA search system which searches the foreign patent information by using European classification system (ECLA), obtained from European patent office, as a search key started to work in 1987. Furthermore, the introduction of the load distribution processing method using two ro more server in 1999 has increased the number of users who can utilize the F-term search at the same time. "Fig. 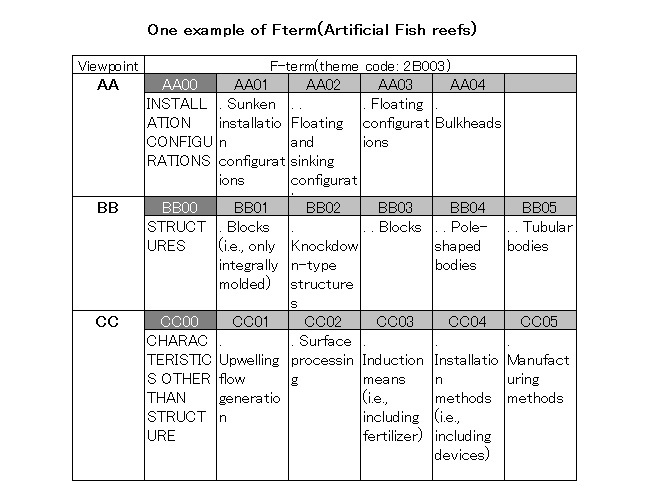 3 EXAMPLE OF F-TERM"
The full text search searching all documents including the specified arbitrary technical term has following merits in comparison with the F-term search. a) The documents before publication with which F-term or FI haven’t been attached yet can be searched for. b) The result of the F-term search is restricted to the technical area corresponding to the specified F-term. On the other hand, the full text search can perform the search which isn’t restricted to the specific technical area. As above a) and b) merits are very important to make an examination efficient, the introduction of the full text search had been a long-standing problem. As the document data of patent applications were stored as the image data at first, it was necessary to prepare text data of patent documents in order to perform the full text search. This preparation of the text data has been achieved since the issuance of the electronic official gazette in 1993. Furthermore, the full text search targeting a large number of documents became technically possible because of the improvement of processing capacity of the server after the latter half of 1990. For this reason, the full text search was introduced in the end of 1999, and it has been essential tool for the patent examination of Japanese Patent Office since then. The above TOPAS project intended to request to file, together with the written documents of a patent application, the paper tape or magnetic tape of its content to Japanese Patent Office. On the other hand, the paperless project was determined to demand the application and the procedure by the electronic medium as a general rule. An online application and an application by the flexible disk (FD) are prepared as the application by the electronic medium. The TOPAS project assumed that the applicant voluntarily enclosed the electronic data with the patent application. However, according to the example of USPTO and EPO, the filing rate of FD was less than 10 percent when they requested to file voluntarily the FD of the document data together with the written document of the patent application at the time of filing patent application. For this reason, in order to diffuse the electronic application, Japanese Patent Office thought that it was necessary to make the big merit associated with the electronic application or to design a system in which the electronic application itself was obligated. Therefore, the installation of the online application was considered as the electronic application for making the merit for applicants. In order to perform the online application, applicants had to prepare the dedicated terminal for electronic application and had to access the network by using this dedicated terminal. Therefore, Japanese Patent Office decided to prepare and publish the standard issue of electronic application terminal which was no less than 400 pages to outsource the development of the dedicated terminal for electronic application to private corporations. Japanese Patent Office adopted, for the identification of this dedicated terminal for electronic application, the method in which, in addition to the applicant identification number (ID) and passcode, the calling party number of ISDN and the terminal number of dedicated terminal for electronic application were preliminary registered and the application from other than these numbers wasn’t accepted. Major manufacturers of computer such as Fujitsu, Hitachi, Toshiba, NEC and IBM started the development of the dedicated terminal for electronic application on the basis of the published standard specification of electronic application. The price of the initial electronic application was expensive, for example, the hardware was about 4.5 million JPY (about 33,962 USD at the exchange rate of December 3, 1990) and the software for the electronic application was about 1 million JPY (about 7,547 USD). As the computerization fee determined to be required to file written application urged the applicants to file electronic application, too, 92 percent of the whole applications were filed as the electronic application in December of 1990 immediately after the installation of the online application. The breakdown was 43 percent of online applications and 49 percent of FD applications. In addition, on the launching date of online application (December 1, 1990), as plenty of applicants aimed to file the first online application, almost all of 120 patent applications and utility model applications filed as the online application at this date concentrated from the 9:00 a.m. to 9:03 a.m.. During the period, all of 69 ISDN lines of Japanese Patent Office were busy condition. In 1993, online dispatching function and online browse function were added as the second version of the dedicated terminal of electronic application. As with the first version, Japanese Patent Office adopted the manner in which it prepared the standard specification and each of the above manufacturers of the dedicated terminal for electronic application added the function on the basis of the standard specification. The addition of this function enabled the bidirectional data communication between applicants and Japanese Patent Office, or, between attorneys and Japanese Patent Office. Japanese Patent Office basically adopted, as the protocol for the browse, the mailbox processing system in which applicants or attorneys receive the forwarding documents in their mailbox. c) Japanese Patent Office distributed the electronic software (Personal computer application software) for free (1998, Third version). In spite of the subsequent price reduction of hardware, the dedicated terminal for electronic application including its application software was as high price as about 3.5 million JPY. For this reason, FD application continued occupying the 30 percent of the whole procedures. In the FD application, the drawings were filed as the written documents. Due to this, Japanese Patent Office has to make image data of the drawings by scanning them so as to make their database. This processing cost a few hundred million JPY per a year, it was the important problem for Japanese Patent Office to reduce this burden. However, because of the small market on electronic application to Japanese Patent Office and the costs of the development, if Japanese Patent Office delegates the development to the manufacturer, it was thought to be unlikely that the price of the software for electronic application was fully reduced. For this reason, Japanese Patent Office adopted the manner in which Japanese Patent Office itself developed the electronic application software (Personal computer application software). WINDOWS 95 (Made by Microsoft), which was effectively the standard in the market on personal computers at that time, was adopted as the platform. The free distribution of this personal computer application software enabled the applicants to file inexpensively the application online by personal computer. For this reason, the FD application was abolished at the end of 1998.
d) The target of electronic application was widened to design and trademark (2000, fourth version). Design and trademark include the color as the constituent element. Due to this, there is the technical problem about the information processing of color such as the standardization of color or halftone (colors other than white and black) and the development of affordable input or output device so as to introduce the online application of design and trademark. However, as JPEG format became rapidly popular along with the popularization of digital cameras, the adoption of the JPEG format of color or halftone for both design and trademark enabled to solve said problem. New electronic application software for expanding the target of electronic application into design and trademark were distributed in January of 2000. The rates of online application one year after the start of the distribution were about 80 percent of design application and about 86 percent of trademark application. Publication gazette before the start of the paperless project was issued in the manner in which the one page of application documents was directly input by phototypesetting in one-quarter of the official gazette. Though the bibliographic information such as the name of applicant was edited by electronic computer data after the installation of the computer which can process the Chinese character on January of 1976, regarding the Specification and the Drawings, the conventional way was adopted. As the electronic application of patent and utility model was started on December of 1990, code data of whole application information became available. For this reason, the issuance of official gazette by code data was started on January of 1993. CD-ROMs were adopted as the memory media. In this published patent official gazette, the front page was newly adopted to improve the convenience. The front page is the first page of the official gazette for posting the abstract and the representative figure together with the bibliographic information. Automation edit of the bibliographic part of official gazette using the data of the record copy system in Japanese Patent Office was started. On the other hand, it was difficult to introduce the automation edit of the Specification and the Drawings. At first, the Specification at the time of filing (36 characters x 29 rows) and the Specification of official gazette (25 characters x 50 rows x 2 columns) were different in the document format. Due to this, the manual edit were necessary. Also, regarding the trimming and the arrangement of image data (figure, table, formula and so on), it is necessary to confirm visually whether it was arranged in only one column of two-column format or in both columns. So, human hand was required. As the reception of the electronic application of design and trademark were started on January of 2000, the Official gazettes of design and trademark were determined to be issued as CD-ROMs in January of 2000. Unlike the patent and utility model official gazettes, the design and trademark official gazettes don’t include the Specification. Also, the bibliographic information had been automatically edited for some time. For this reason, automation edit of the design and trademark official gazettes after January of 2000 became possible. The automation edit of the Specification of patent or utility model was important problem to reduce the cost of issuance of official gazettes. Due to this, it was determined to unify the document format of the Specification at the time of filing and the Specification on the official gazette in 2004. And, regarding the Drawings, Japanese Patent Office returned to the manner of edit of published official gazette before the paperless project in which four pages of figures of application documents were arranged as thumbnails in one page of official gazette, thereby the perfect automation edit of patent and utility model official gazette becoming possible. Japanese Patent Office has collected the both domestic and international industrial property rights information centered on the official gazettes in each country since before the paperless project to make them available for user’s inspection. Also, it has developed the total document database as the database in which Japanese whole official gazette to date and major official gazette abroad were collected since 1986. And, it established the intellectual property right center approximately for each of prefectures (48 sites) and installed the terminal for the inspection of the official gazette and the viewer of CD-ROM official gazette. Moreover, Japanese Patent Office launched the internet homepage at April of 1996 with the popularization of the internet. Furthermore, “Industrial property digital library” was lunched in the Japanese Patent Office homepage on internet in March of 1999. Industrial property digital library enabled to search for about total 4800 documents including more than 100 years’ official gazettes of patent, utility model, design and trademark, official gazettes of each foreign country by the document number or various types of classification. 1. Ishii Tadashi and others “Electronic government and intellectual property – the technology and development of paperless system”, Foundation economic industrial investigation committees, Publishing date: October 10, 2013. COPYRIGHT © BENRISHI.COM 2001-2013 ALL RIGHTS RESERVED.